You know how sometimes, things just feel right? That’s how I felt the first time I walked into the space that I now call my photo studio. It’s an old cottage building (situated among other cottage buildings for businesses in northwest Houston, TX) with a front and back porch and outside stairs to my second-floor space. Sloped walls, reminiscent of an old barn, along with the cheerful pops of color from the furniture and pillows make clients squeal with delight upon entering the space. Natural light pours in through the windows on both sides of the room, bathing the 600-square-foot space in gorgeous, soft light that is perfect for the way I prefer to shoot images. Even on a cloudy or stormy day, there is ample light to shoot. Almost exactly a year ago, I caught the Sue Bryce bug and realized that despite about a million on-location, natural light photographers in business in the northwest Houston suburbs, no one in my area was specializing in contemporary, fashion-inspired portraiture for women. I kept wondering how I could better serve one of the most significant shopping demographics in the world (women fifty-plus) while at the same time generating additional revenue on a more consistent basis throughout the year. 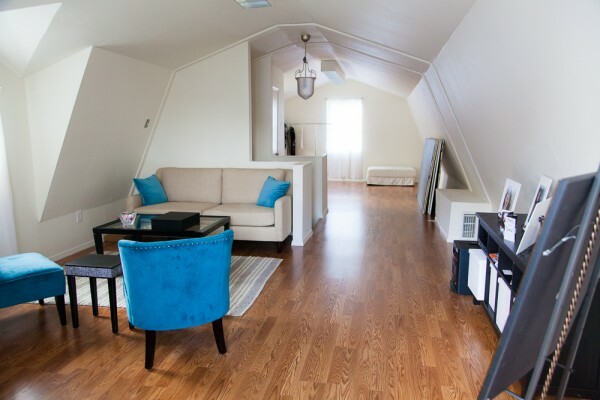 I knew I didn’t want to run a studio from my home (it’s against our deed restrictions anyway), so I began crunching the numbers and looking for a suitable space that would meet my shooting and budget requirements. A few months later, armed with Sue’s CreativeLive workshops and a huge amount of faith, I took the leap and signed on the dotted line! 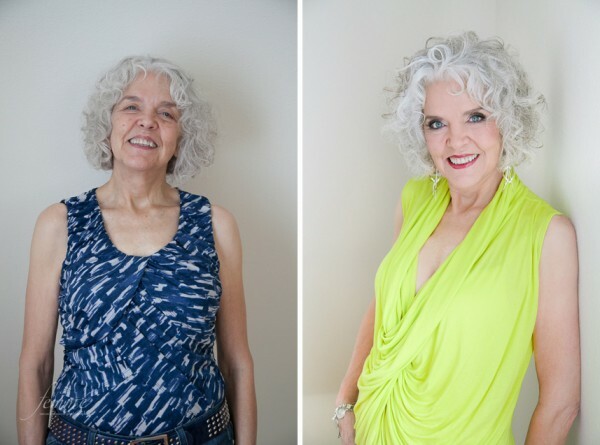 Below is one of my lovely 70-something clients. In her pre-session consultation she told me, “I want to do this before I get too old!” Funny that I have 40-year-olds tell me the same thing. In the “after” shot, she was posed on the wall next to the window (main light source, which was camera-right) with a large white reflector camera left for fill. The studio is divided almost exactly in half by a staircase from the first floor (I only lease the second floor). One side of the studio is dedicated to shooting, while the other side serves as the hair and makeup area as well as my consultation space. This is where I meet with clients prior to their shoots and where I host my viewing and ordering sessions, if they have opted for an in-studio ordering session. I also offer in-home ordering sessions; all ordering is done in person at the time of viewing. 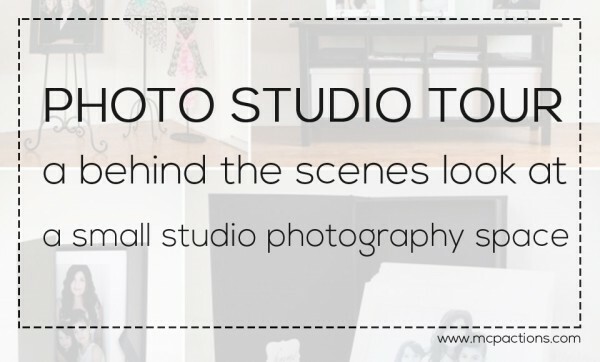 One thing I love about having a studio – it is ALWAYS exactly how I left it (which cannot be said for my home!). 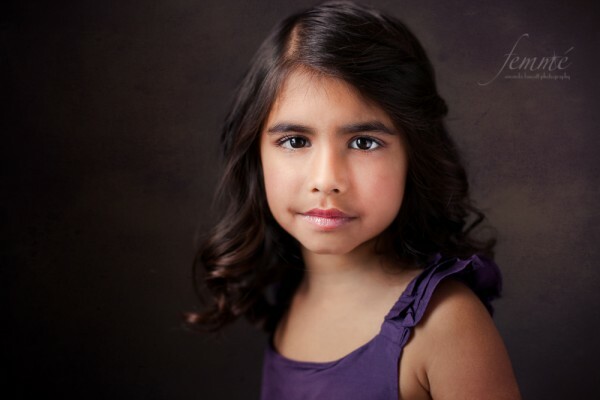 All of my images are shot in a small space using only window light and reflectors. I use painted polystyrene boards as my backdrops, which I spice up in post with my processing and textures. I can get lots of different looks with this setup, from a moody and contrasty black and white (which I achieve by almost completely covering the window and only letting a small amount of light through with no reflector) to a luminous backlit shot (using white foam core reflectors on either side of the model to bounce light back to the face) to classic loop and Rembrandt lighting patterns. I love the flexibility that I have, given the simplicity of my setup. 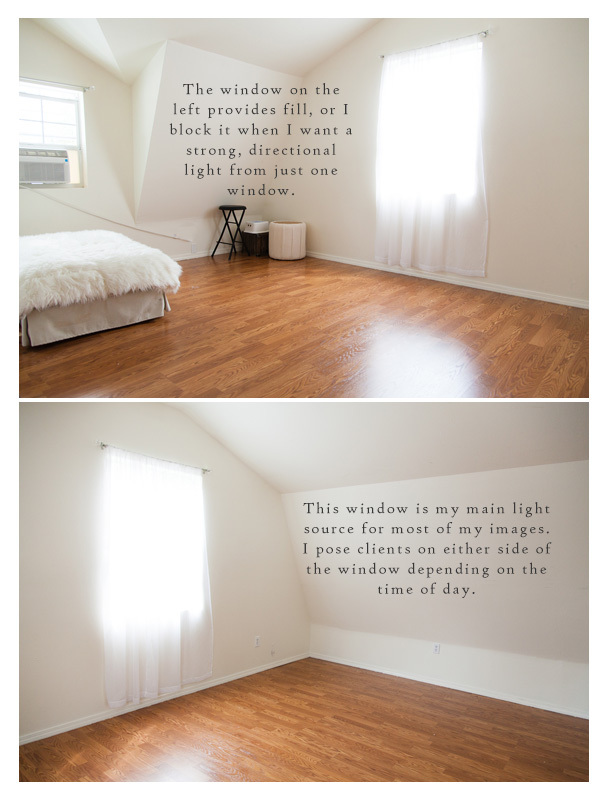 All of the following images were shot in a five-foot area around the window, using either the white wall, backlight from the window, or painted polystyrene boards. Here is the shooting space. Not a lot of room, but the resulting images are well-loved. My Canon 24-105/f4L lens is my go-to lens for this space, but I often use the 85mm/1.8 for tighter headshots and the 50mm/1.4 as well. I shoot with a Canon 5D Mark ii. The next image is one of my favorites. I love the soulful expression in her eyes and the beautiful shadowing across her cheek. To create this image, I stood one polystyrene board (painted a medium/dark gray) against the wall camera left, partially covering the window. I stood another painted board directly behind the model, so that the two boards form a 90-degree “V”. I then asked the model to stand inside this “V-flat” with her body turned toward the window, and to look at me without smiling. I used the 50mm/1.4 lens at f/2.5. The sloped walls in the studio present a challenge for hanging multiple large prints. A 24×36 canvas gallery wrap hangs over the makeup table (see makeup area photo above), and a 20×24 framed print is featured on a floor easel. My goal is to sell either a wall portrait and folio box to every client, so I keep a folio box (from Finao) filled with beautiful sample images on the coffee table in addition to canvas and float wraps. More matted images are on display with tabletop easels on top of the credenza. I found that having the studio and opening up the contemporary portrait/glamour genre in my business has really struck a chord with my clients. 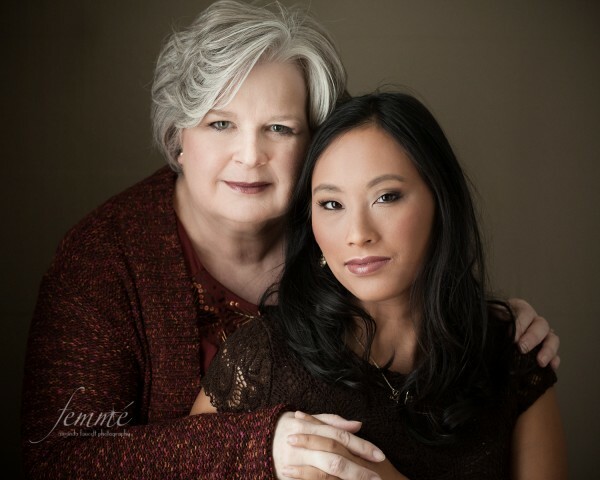 Many of my shoots have been mother/daughter “girls’ day out” experiences in which they not only get to be pampered for a day, but also enjoy a fantastic day of making memories together. I’ve had so many clients tell me that their session gave them a boost of confidence and really made them feel beautiful, which is better than any financial reward. It has also benefited me financially though – I hit my total 2012 revenue at the end of June this year! The image below was created next to my main window, using polystyrene painted boards behind the models and camera left with a large white reflector for fill. I used the 24-105L lens at f/4. Knowing what I wanted in a studio space. I knew I didn’t want a strip center or office building. Knowing exactly what I was looking for helped me be efficient in my search for a space. Understanding all of my business costs and knowing how much revenue I would need to generate to pay myself the salary I needed as well as cover all of my additional expenses. This is a critical step – taking on the additional overhead of a studio without fully understanding the financial implications can spell disaster. Really working with the clients to ensure they are posed in the most flattering way and are giving me natural, beautiful expressions. Gorgeous expression and connection through the eyes is truly what makes the portrait. Working in this space has been a dream come true, and I can’t wait to see what the future holds! Amanda lives in Tomball, TX with her husband and two kids, whose social calendars put hers to shame. 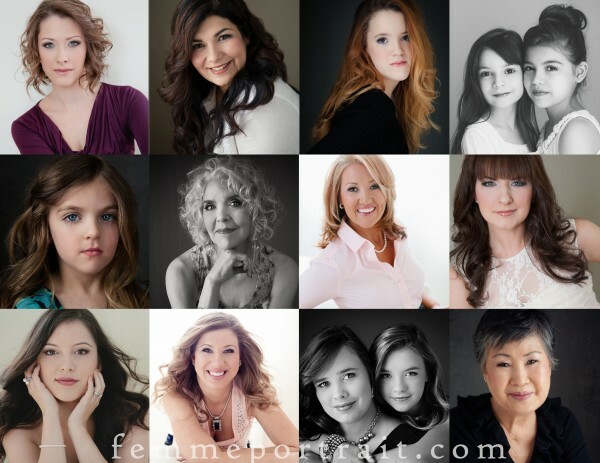 She is in her fourth year of business as a portrait photographer, but just launched the new fashion-inspired portrait genre, www.femmeportrait.com, in January of 2013. Amanda loves photographing women; enjoying wine, chocolate and fine cheese; and buying new makeup. You can see more of her work on her Femmé Facebook page, her babies/kids/families Facebook page and www.amandafaucettphotography.com. This weekend I’m moving out of my 6,000sqf commercial space. eeeek! I’m moving into 1,400sqft on the 1st. I’ve been lamenting…thinking, why did I go so small?! But now seeing beautiful smaller spaces like yours, I’m getting excited about the possibilities! Thanks for sharing! Your work is wonderful, and it’s very encouraging to see what you can accomplish in a small place. I’ve always felt restricted with limited space, but it looks like I have to re-think it! I’m so glad you enjoyed it, Kristin. Best of luck to you in developing your photography!